The BBC and partners today unveiled the BBC micro:bit – a pocket-sized, codeable computer that allows children to get creative with technology. In the BBC’s most ambitious education initiative for 30 years, up to 1 million devices will be given to every 11 or 12 year old child in year 7 or equivalent across the UK, for free. In the 1980s, the BBC Micro introduced many children to computing for the first time. Part of the BBC’s 2015 Make it Digital initiative, the BBC micro:bit builds on the legacy of the Micro for the digital age, and aims to inspire young people to get creative with digital; develop core skills in science, technology and engineering; and unleash a new generation of digital makers, inventors and pioneers. The UK currently faces a critical skills shortage in the technology sector, and the BBC and our partners aim to help change that. Tony Hall, Director-General of the BBC says: "Just as the BBC Micro introduced millions to personal computers 30 years ago, the BBC micro:bit can help equip a new generation with the digital skills they need to find jobs and help grow the UK economy. It's the unique role of the BBC that allows us to bring together an unprecedented partnership to deliver such an ambitious project." 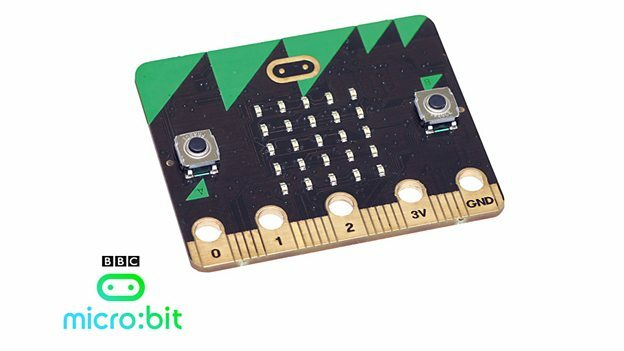 The BBC micro:bit also connects to other devices, sensors, kits and objects, and is a great companion to Arduino, Galileo, Kano, littleBits and Raspberry Pi, acting as a spring-board to more complex learning. On-board motion detector or 'accelerometer' that can detect movement and tell other devices you’re on the go. Featured actions include shake, tilt and freefall. Turn the micro:bit into a spirit level. Light it up when something is moved. Use it for motion-activated games. A built-in compass or 'magnetometer' to sense which direction you’re facing, your movement in degrees, and where you are. Includes an in-built magnet, and can sense certain types of metal. Each element of the BBC micro:bit is completely programmable via easy-to-use software on a dedicated website (available later in the summer at microbit.co.uk) that can be accessed from a PC, tablet or mobile. Your personal area on the website will allow you to save and test your creations in a simulator before they are transferred to your micro:bit, and the available tools scale to be as complex as your ideas, imagination and skills require. The micro:bit was first conceived by BBC Learning in 2012, and initially developed together with the BBC’s award-winning R&D department. The scale and scope of this unique initiative has only been made possible by an unprecedented collaboration between 29 international organisations, pioneering start-ups and transformative education organisations. The BBC is the overall editorial and project lead for the micro:bit, coordinating the partnership, micro:bit development and delivery, learning resources and on-air and online inspiration for teachers, schools and makers across the UK. Product champions, who will help to support the device through outreach, engagement, educational resources and additional services include, Bluetooth SIG, Bright Future, Cannybots, Cisco, Code Club, Coderdojo, Code Kingdoms, Creative Digital Solutions, CultureTECH, Institution of Engineering and Technology, Kitronik, London Connected Learning Centre, MyMiniFactory, Python Software Foundation, STEMNET, TeenTech and the Tinder Foundation. More details on each partner’s role and contribution can be found here. Fundamental to the success of the BBC micro:bit, the BBC and partners will be working closely with teachers, educators and schools over the summer to ensure that resources, information and support are available in advance of micro:bit distribution this autumn, supporting the curriculum. BBC Learning will also provide resources including Live Lessons, getting started videos, projects and tutorials. Teachers will receive their BBC micro:bits just after February half-term 2016, giving them the opportunity to familiarise themselves with the device and build lesson plans before the delivery of up to 1m devices to children begins in the same school term. The BBC micro:bit initiative aims to make a huge impact in 2015 with the BBC and its partners committed providing up to 1 million micro:bits before the end of the year. And it won’t stop there. The technical specifications for the device will be open-sourced, and the partnership plans to collectively develop a not-for-profit company to oversee and drive the micro:bit legacy. This will enable additional micro:bits to be made commercially available in the UK and internationally through various outlets in late 2015. Make it Digital is a BBC initiative to inspire a new generation to get creative with coding, programming and digital technology. Make it Digital will help all audiences see how Britain has helped shape the digital world, why digital skills matter and their growing importance to our future. For younger audiences, Make it Digital will help them discover the world of digital, see their creative potential in it and inspire them to take their first steps in computational thinking and digital skills. The BBC hopes that together with its partners, it will make a lasting impact and ensure audiences can continue their digital journeys long after 2015. This page has been updated to ensure it includes the most accurate details of the project. It was edited on 18/11/15 and on 25/01/16 to reflect revised distribution timings across the BBC micro:bit project. More information is available in two blog posts, here and here, by Head of BBC Learning, Sinead Rocks, on the About the BBC Blog.